Well we’re thrilled to be celebrating winning awards at a prestigious national brewing competition. In total we walked off with 4 awards awards at the Society of Independent Brewers (SIBA) national awards, held this week in Liverpool. Pick of the bunch was our DewHopper Norfolk lager which won gold in the Eastern regional heats where it was judged against craft lagers from 7 counties across the eastern region. This victory qualified the lager to be judged for the national champion alongside 7 other craft lagers. Amazingly for such a small micro-brewery this was the third year in a row that our lagers had reached the top 7 in the country. Naturally we are delighted that we were judged to be in the top lagers produced in the country and to continue our run of representing craft lager from Norfolk for the 3rd year in a row. 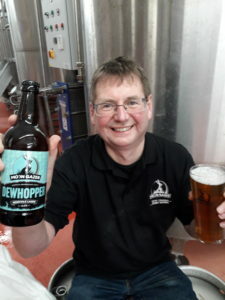 DewHopper is a light, easy drinking 4% abv lager and is judged in the Standard Lager and Pilsner category which as you can imagine is fiercely contested as more and more craft brewers and regional breweries create lagers. To be awarded Gold against such a strong line up was amazing. We take great pride in our craft lagers, but in fairness we are probably best known for our range of Moon Gazer ales, so the recognition for lager was really rewarding. To be voted best in the east is amazing, but the accolade of being in the top 7 in the country is something which the whole team is so proud of. But the night just got better as we then went on and were awarded a silver in the national final!! There is a strong Norfolk flavour in the lager as it is brewed using Norfolk Maris Otter barley from Norfolk maltster Crisp Maltings. The other ingredient – the hops however are German and Czech as they produce hop varieties well suited to lager – such as Saaz and Hallertau, but clearly this blend of Norfolk and European ingredients is a winning combination. We are now looking forward to developing its lager range further which will include the launch of a ginger flavoured lager for the summer. Two of our other beers also picked up awards in the regional heats – with Moon Gazer Blonde IPA winning a silver medal and our gluten free Moon Gazer Pacific Pale Ale winning a bronze.